On Monday, May 1, an earthquake of 3.0 magnitude was felt in Santa Monica and across West L.A.
SANTA MONICA—An earthquake with a magnitude of 3.0 was felt across Santa Monica and West Los Angeles on Monday, May 1, at around 10:28 p.m. 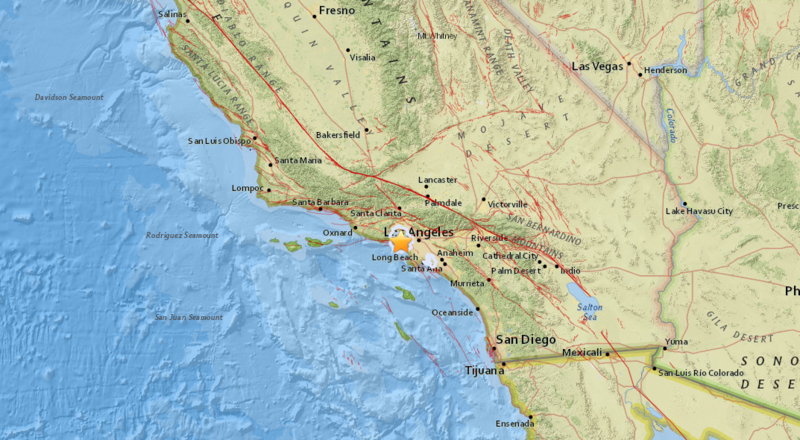 According to the United States Geological Survey (USGS), the earthquake struck about 1.5 miles northwest of Santa Monica, near Pacific Palisades, at about 5.4 miles deep. Approximately 2,000 people in Santa Monica, Pacific Palisades, Culver City, Playa Vista, and other parts of the Westside and the San Fernando Valley experienced the jolt, according to reports. Foreshocks are mild tremors that precede larger earthquakes. Dr. Jones added that Santa Monica, which runs from east to west, is “not an unusual spot” for an earthquake to strike, as it is one of the significant faults in Los Angeles. She indicated that foreshocks do not necessarily reduce the likelihood or magnitude of a larger earthquake. Though the ratio of small quakes to large quakes is constant, a major earthquake may strike at random.